The stories are written in a simple yet descriptive manner, and an early reader will have no problem reading the text. Some of the stories include dialogue, and they would be fun for families to read together aloud. The book covers the stories of Abraham and the three visitors, Elijah being fed by an angel, Daniel and the lions, Mary and the Nativity Story, Jesus and the little children, Jesus’ death and resurrection, and John’s dream. Massari’s illustrations, with a bit of abstraction, remind me of something I might see in an art museum. 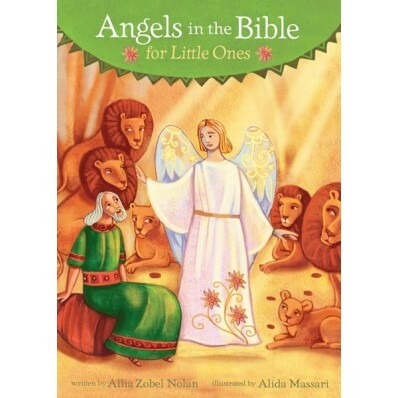 I think this was a great idea for a book, highlighting the stories of angels in the Bible. The book will help young children familiarize themselves with the Scriptures. Though the book compiles Biblical accounts of angels, the text points to the story of Jesus, showing how he lived, and died, and saved mankind. This Bible storybook would be great tool for a family devotional or bedtime story.